The original title of this post was Take The Leap. I had a plan, you see, and it involved thinking big, for once, and taking a momentous leap. I thought about it at great length and wrote draft posts about it and researched it and then, a few days ago, decided it wasn't for me. Which was a huge relief. Because the one thing I couldn't figure out while planning and scheming was how to clear enough space in my life to take a big leap without crashing headlong into my other longstanding, and quite precious, commitments. So I decided on a different title for this post instead. You know that thing you've been meaning to do? Or have always wanted to do? Or are already doing, but haven't quite finished yet? That's the thing I mean. It's the thing that's at or near the top of your list; you think about it when you're in traffic, or in line at the grocery store, or just drifting off after a really long day. It's the thing that you're totally going to get to someday, when the time is right, which just might be today, but if that's the case then it'll have to be really quick or divvied up into smaller, more manageable piles. But you're going to do it, nonetheless. I like to think that do that thing has a sense of humour. It doesn't get bent out of shape when plans have to be put on hold for a sick child or a friend in need. It fully embraces the same active, forward moving momentum of a leap, but it doesn't leave you hanging in mid-air when things don't go as anticipated. In short, it feels possible, achievable. For me, doing that thing means growing Grace is Overrated. I'm hoping that you might like to get involved, too, and tell me about that thing that you're doing -- that one forward-moving, soul-satisfying, now-is-the-time thing -- in between all of the other not-entirely-negotiable things you're already doing. That little project that's been in the works here for the past year and a half. This is the year that I'll post journal page 52, a year's worth. Except that I don't want it to end there and I don't think it will, but I'd like it to evolve. And I think I know how. The shop. 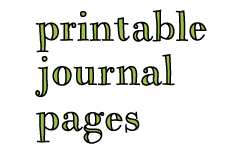 There are two new journal-related categories of items I'd like to introduce. Communication with you. This is something I should be so much better at by now. 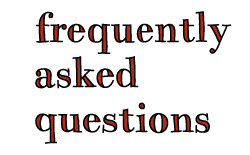 I have a plan for this aspect of the blog as well, which involves being more open, less self-conscious, and more conversational. It starts with this post. What have we covered? Hold off on big leaps for now, do that thing instead, grow the blog, keep the printable journal project alive and kicking, develop new items for the shop, communicate better. It's still a lot, but I think I'm up for it -- not as a momentous leap, but as an evolving, one-thing-at-a-time, just-do-that-thing-already endeavour. I'll keep you posted. Hi Melody! Yes, that's a habit I'm trying to break, too. Working on facing those nagging things head on, then basking in the satisfaction of having done them. Best wishes on all of your things! A LEAP even sounds scary; Do that thing sounds like a baby stepping, totally can do that in little bites type of thing. I'm looking forward to watching it progress on the blog. I'm using a similar idea to tackle a small cookbook I've been wanting to write, breaking it down into little nibbles of time, doing something for it every work day, no matter how small. Even five minutes of progress is still progress, and they add up. Best of luck! Hi Mrs. Mouse! I love your approach, that you're not waiting for that hour or afternoon of uninterrupted work time. Sometimes 5 minutes is all we get. :) And a cookbook, so exciting! I hope you'll share more about it as it comes together! Do that thing, sounds like it could be set to music! 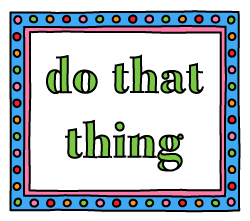 I think "Do That Thing" should be my mantra for the year. Goodness knows I've put off so much. Hi Silverlotus! I hope you'll let me know if your new mantra works for you. :) Best wishes with your things! Congrats on your studies, Amy Eileen! Making time to do the creative work has become important to me as well. I hope you'll share your ups and downs as you go along. I love your suggestion about encouragement/accountability; it would be awesome to hear from fellow "thing do-ers" as we go. 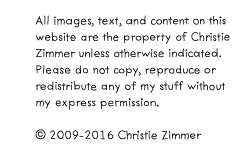 I'll be thinking about how to encourage the discussion further! I heard someone say, "Don't put off something for fifteen years that could be done in fifteen minutes."